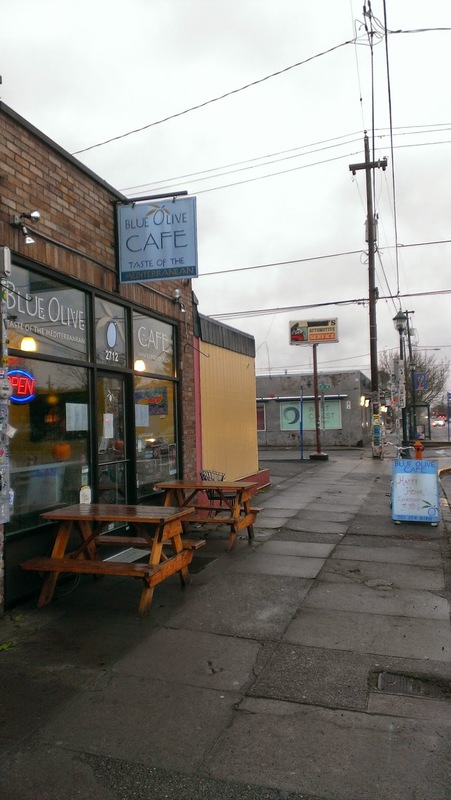 Looking for the next great happy hour deal in our new home of Portland, I ended up at the Blue Olive Cafe. I was in the mood for a late lunch, so I hopped on the bike and rode a few minutes to Alberta Street, sure I would have a million options to choose from. However, I didn't take the time of day into account. I got there at 3:30, and much to my chagrin, discovered that many of the restaurants on Alberta don't start happy hour until 4:00! While I possess may virtues, patience is not one of them, especially when I'm hungry. The fact that Blue Olive Cafe's happy hour starts at 3:30 is the main factor that got me in the door. That, plus I love falafel. The cafe is a rather simple establishment, and is not particularly noticeable from the outside. It's on a less heavily trafficked part of Alberta Street, farther towards the eastern end. The inside of the cafe is more inviting, with colorful local artwork adorning the walls and adding to the general cheerful feel of the place. I was the only customer there, and two people were working, a cook and a girl at the counter. It has a very clean feel, and in addition to a lot of tables, there are counters up front that face the windows so you can people watch along Alberta. There are also a few picnic tables outside to enjoy those rare sunny days. 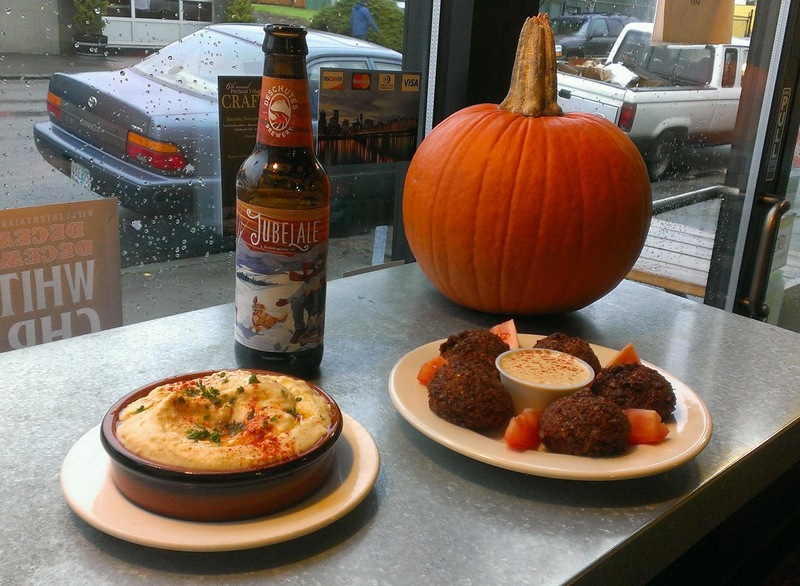 I was ravenously hungry when I walked in, and after a quick look at the happy hour menu, I chose the $4.00 falafel mezze and the $3.00 hummus dip. To wash it down, I chose a winter ale from Deschutes Brewery, for $2.75. Falafel - One of my favorite Mediterranean dishes when it's done well, falafel is something I could probably eat every day. Fortunately, the Blue Olive knows how to cook their balls. 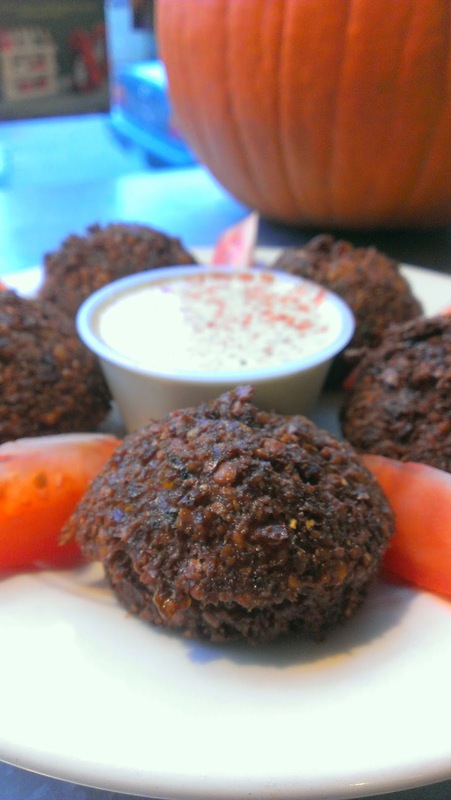 The dish consists of 5 falafel balls and a small cup of tahini for dipping, along with some fresh tomato. The falafel balls themselves were great, perfectly crunchy, soft on the inside and nicely seasoned. They were a nice consistency when dipped in the tahini, and the fresh tomato is a nice complement to the savory flavors of the deep fried chickpeas. Hummus - Another classic Mediterranean staple, the Blue Olive knows how to whip up some hummus. Theirs is especially creamy and light, and not overpowering in any one of its flavors. They serve it with a basket of grilled pita bread, and they have a gluten free option available, but it costs $1.50 extra. Overall, the food was very tasty. Despite the fact that I was starving when I arrived, I couldn't finish it all and had enough left over to take with me and eat for lunch the next day. Like a lot of the places we've tried so far, the Blue Olive Cafe doesn't have typical table service. You order at the counter, take your drink with you, and someone brings brings your food to you when it's ready. Then it's up to you to bus your own dishes when you're finished. The girl at the counter was very nice and friendly, as was the guy working the kitchen, and at one point while I was there the owner came in, and she was super friendly as well. For the food, the beer, and a little tip for the friendly and accommodating staff I got out of there for around $12.00 and I had enough food for lunch the next day as well. Daniel does possess many virtues.